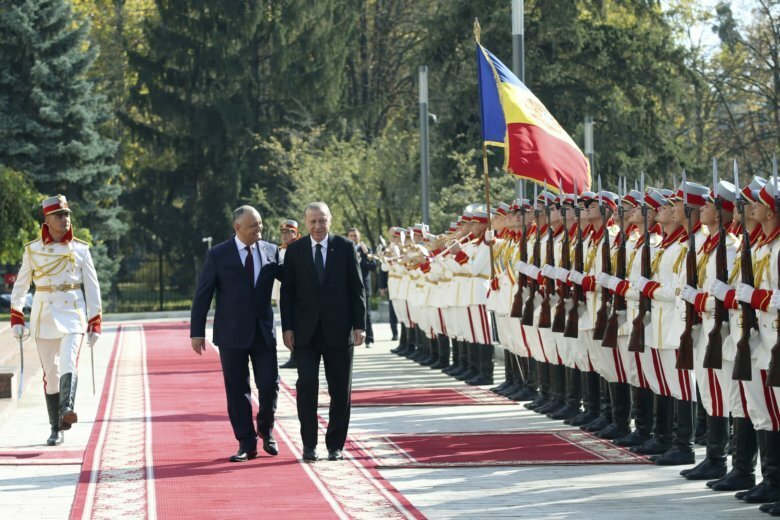 CHISINAU, Moldova (AP) — Turkish President Recep Tayyip Erdogan arrived in Moldova Wednesday for a two-day visit aimed at boosting political and trade ties with the former Soviet republic. Erdogan met President Igor Dodon for talks at the presidential building, which was reopened for the occasion. Turkey funded repairs the building required after it was ransacked in 2009 by demonstrators protesting elections they said were rigged by the then-communist government. The two presidents discussed the conflict in the pro-Russian separatist republic of Trans-Dniester, eastern Moldova, which broke away from Moldova in 1990 over fears it planned to reunite with neighboring Romania. “Turkey unreservedly supports the territorial integrity of Moldova and calls for a peaceful settlement,” Erdogan said. In a joint operation last month with the Turkish intelligence service, Moldova expelled seven Turkish teachers alleged to have links to exiled U.S.-based Muslim cleric Fethullah Gulen, accused by Turkey of being behind a failed coup attempt in 2016. It is unclear what happened to the teachers after they returned to Turkey. Others criticized the visit as it wouldn’t help the country’s aspirations to join the European Union. Moldova signed an association agreement with the EU in 2014 and hopes to eventually join the bloc. On Thursday, Erdogan will visit the semi-autonomous republic of Gagauzia, home to a Russian-speaking Christian Turkic group. Alison Mutler in Bucharest, Romania contributed to this report.